Great For Sizes S-L Only. How Very Sad! The Fishnet Studded Trim Bustier by Coquette would look fabulous on those who can fit it comfortable. The bustier is only available in sizes S-L which really limits who can wear it best. I received the size large and it was far too tight on my XL body. It makes me sad because it's just so darn pretty. I guess it's just another article of clothing to add to my "lose weight" pile of clothing. well made, comfortable material, stretchy, two rows of eye closures, versatile bustier. no larger sizes, quite expensive. 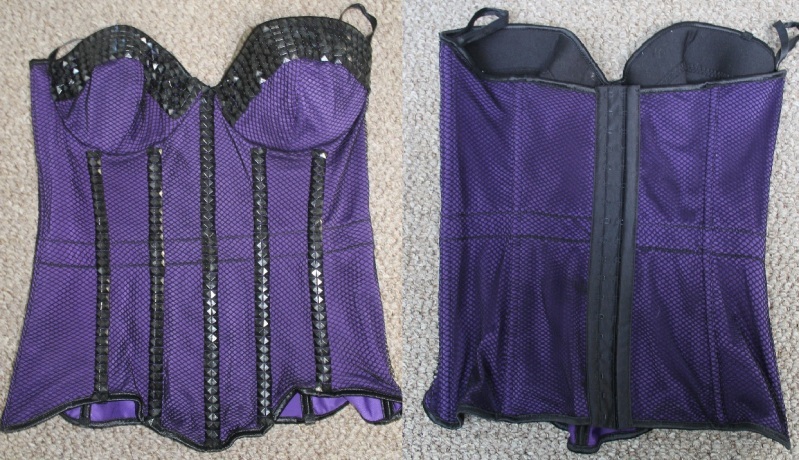 I was really excited to receive the Fishnet Studded Trim Bustier by Coquette for review. I previously had reviewed the Fishnet Studded Dress, and I really enjoyed it! I usually wear a size XL comfortably, but for bustiers and corsets I usually fit well in a large. I received the size L to review but the piece is also available in size small and medium. Sadly, it is not available in plus sizes. The bustier arrived on a padded Coquette hanger surrounded by plastic. The hanger is excellent to use for storing the piece when it is not being worn. You could keep the plastic if you wanted to, but I never do. There was a small sticker on the surrounding plastic stating the product name and size. Attached to the bustier was a cardboard tag and two zip lock styled bags. The cardboard tag states the brand, product name, size, and company website. Also, there were a few photos of a model wearing the bustier on the tag. In one of the zip lock style bags there was the two detachable shoulder straps and the other bag held the four detachable garter straps. The bustier is 80% nylon and 20% spandex (exclusive of trim). 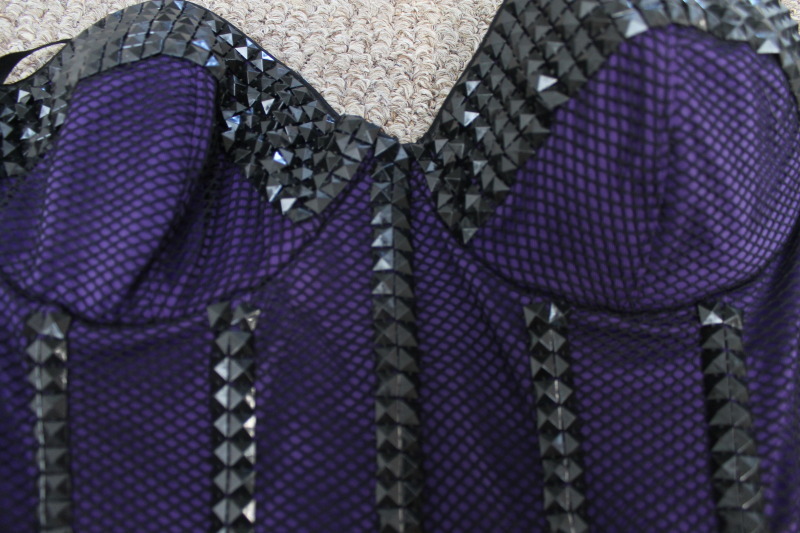 The main colour of the material is purple, with a black fishnet material overtop. The material of the bustier is quite stretchy. There is an elastic band that runs horizontally along the inside centre of the bustier for extra stretch. The material is thin, though it does not become sheer the more you need to stretch it. I’ve taken measurements of the bustier laying flat, unstretched. The bustier was done up on the first row of eye closures (loosest fit). If you need additional measurements, send me a message. The bustier does up with hook and eye closures down the centre back. There are 2 rows of 18 eye closures with a little over a ½ inch gap between the two rows. There are 9 plastic boning pieces in total; 5 down the front, 2 in the back, and 1 down each side. The 5 boning pieces in the front of the bustier are covered with two rows of black, plastic studs. The top area of the cups also has 6 rows of studs along them. The loops to attach both the garter straps and the shoulder straps are on the inside of the bustier so if you choose not to wear them, it won’t look awkward. I like wearing my bustiers and corsets out in public as a top so I don’t get much use out of the included garters. If you plan on using the garter straps, you’ll need to have a pair of stockings to attach the straps to as the bustier does not come with any stockings. The cups of the bustier have both underwire and padding in them. You do not need to wear a bra with this bustier. There is a seam line that runs vertically down the centre of each cup. The care tag states that the bustier should be hand washed only and hung to dry. While I was wearing the bustier, the inner material felt comfortable against my skin and I did not experience any issues with it irritating/bothering my skin. Though, I did notice that if I were flailing my arms, the skin on my inner arm would rub against the plastic studs along the top of the chest. This did cause a bit of irritation but this would only affect those who are wearing the bustier out in public while dancing, or in the bedroom doing a lot of arm movement. It wasn’t an extremely terrible discomfort, but it was a tad bit annoying. The bustier was easy to put on by myself. I did the hook and eye closures up at the front of my body. Once they were all hooked into place, I turned the bustier around so that the hook and eye closures would sit at the centre back of the piece. The size large bustier fit my XL body, though it was very, very tight. I think that if the bustier were offered in an XL, it probably would have looked better on me. The boning didn’t seem to do any shaping for my body, as it’s flexible plastic. My chunky hips really seemed to stand out with this bustier. The bustier fit me best on the first row of eye closures (loosest fit). My size C chest seemed to fill the cups on the bustier completely and I think that anyone with a larger chest may find it too tight. The elastic band outline was pretty noticeable when I was wearing the bustier. This could be because the bustier was really tight on me, but it really stood out. I feel that the company should have used a deep purple thread so that it was less noticeable from the outside of the bustier. They used a black thread instead. Below you can see a few photos of me wearing the bustier. I really didn’t want to share them with you but figured it would be best for “review sake”. The first photo is a front view. It shows you how extremely tight it is (on my XL body), and how it really doesn’t “slim” at all. The second photo is a side view showing the elastic band and how it actually cuts into my flub. The third photo shows the elastic band and my larger hips. The boning on the side won’t do anything for you if you have larger hips. It’s flexible plastic, how much could it really do for you… The fourth photo shows my C chest filling out the cups of the size large. Overall, the bustier is pretty fantastic. I don’t think it really worked well for my XL body, but it’s gorgeous anyway. It’s comfortable and everything is sewn perfectly. If I lost a bit of weight so that I could fit into a size large comfortably, I’d wear this bustier all the time. The only issue I have with this piece is that it’s not available in any larger sizes other than large… and that’s probably because a size XL would look better on me. Other than that, it’s a fabulous bustier for those who can fit into it. I still like the bustier but sadly, I can still not fit into it without looking like a chunky monkey. It'd be so nice if this piece was offered in a larger size because it's great quality and very beautiful. it's even more gorgeous in your photos...adding this to my "need" list! great review - need need need! I'm so disappointed with the fit of this for that expensive price. Sigh. Thanks for the warning. Thank you Lucky me, I can go with larges to extra larges. Usually only get XL if it's built smaller. Great review. I really love the way this looks. I know there are parts of your body that you're not comfortable with, but this would look hella cool with a boyfriend blazer jacket.Wear it out to a club. - Very hot. Wonderful review! Seriously considering this now. Thanks!! Great review! looks like a really good product. Thank you for viewing Fishnet studded trim bustier review page!